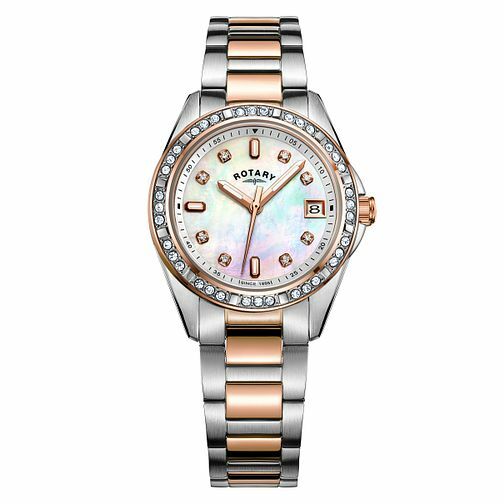 This Rotary ladies' timepiece has a 33m two tone rose gold PVD stainless steel case with mineral glass, fixed crystal bezel, white mother of pearl dial and a date window at the 3-o-clock position. Each hour is marked with a crystal, for an extra eye catching shimmer! It is powered by quartz movement and is water resistant up to 50 metres. Rotary Ladies' Two-Tone Rose Gold Tone Bracelet Watch is rated 4.8 out of 5 by 12. Rated 5 out of 5 by Anonymous from So expensive looking for the price Was so pleased when this arrived it is so much more expensive looking than what I paid! I was sceptical at first as I’d never heard of the brand but the watch is extremely similar to the Rolex style watches. I loved it and still love it now.